Your VARK Academic Profile will help you understand your preferences for learning. Your Profile is a PDF containing helpful advice about your learning preferences, customized for your VARK scores. Your profile, including helpsheets, is approximately 10 pages long. What advantages and disadvantages there are to your learning preference. 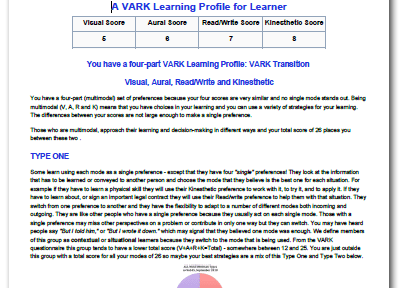 How some other learners like you use their VARK learning preferences. What VARK indicates, and what it does not. The VARK Profile is available immediately after you complete the VARK questionnaire online and elect to purchase. The price is $20.00 NZ – about $US14. My aim is to help bring them back up to a level with their brighter colleagues, rather than leave them behind and disheartened.